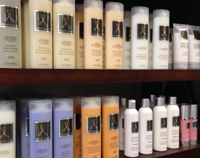 Our stylists personalize your hair care regime to suit your specific needs. We are always looking for new talent at Village 9 Salon! Village 9 Salon offers a fun, creative and professional environment for each of their independent business owners to work to their fullest potential and cater to their unique Clientele. The independent stylists offer their own unique perspective and background to the artistry of hair, skin, and nail beautification—one is certain to be the perfect fit for you. Located in historic Leesburg, VA, Village 9 Salon hosts hair stylists and nail experts that offer years of industry experience, creativity, and basic love for what they do to make their Clients happy, confident, rejuvenated, and inspired. Each professional has extensive hands-on training with many world-renowned industry leaders and continue to advance their skills to keep up with the latest techniques and perfecting classic styles. Contact your stylist for hours and appointment availability. With over 16 years experience, Kelly boasts a successful career reinventing hair that has been an inspiration to the hair industry. Her participation in hair shows throughout the United States has awarded her styles and creations being published nationwide. Kelly, a native of Loudoun County, opened Village 9 Salon in 2010. It's been the perfect venue for her to redefine the artistry of hair design. She strives to provide the ultimate experience to all her Clientele.